Cod is a wonderful fish that has a very mild, buttery and flaky taste. Adding lemons or limes really enhance the flavor without over powering the taste. Just season with salt, pepper and some butter and you have a beautiful, healthy meal in 15 minutes. Cod, specifically, promotes cardiovascular health because it is a good source of blood-thinning omega-3 fatty acids as well as an excellent source of Vitamin B-12 and a good source of Vitamin B6 both of which are needed to keep homocysteine levels low. Besides being an excellent low-calorie source of protein (a four-ounce serving of cod contains over 21 grams), cod contains a variety of very important nutrients and has also been shown to be useful in a number of different health conditions. So if you want to prepare a quick, healthy and nutritious meal buy some cod and you’ll be at the table enjoying your meal in less than 30 minutes. Enjoy! Preheat the oven to 425 degrees. 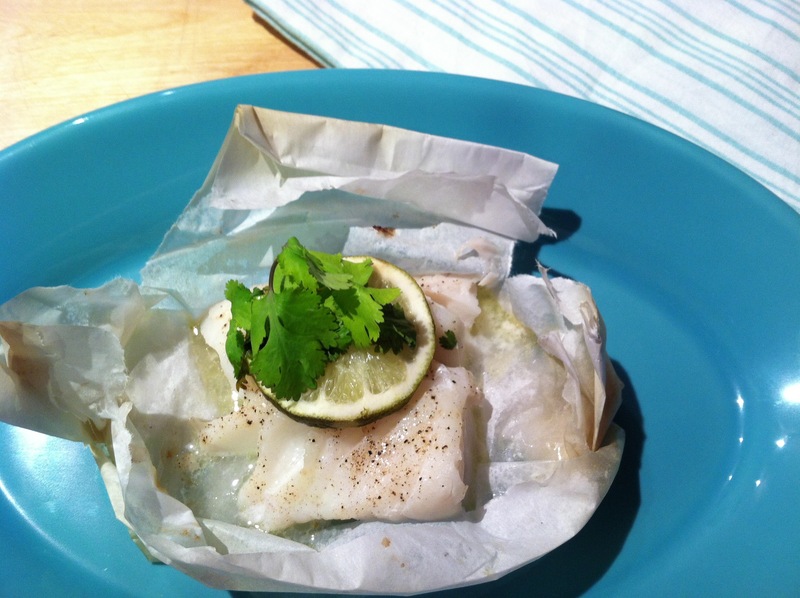 Take two pieces of parchment paper large enough to wrap each individual piece of fish. Place each fish on its’ own parchment paper. Generously season with the salt. Add pepper. Place 1 tablespoon of unsalted butter on each piece. Top off with the cilantro and fresh lime slice. Tightly fold the parchment paper into packages and make sure they are sealed well. Put the packages on a baking sheet and bake for 10 to 12 minutes, depending on the thickness of the fish. Remove and allow to rest a few minutes. Place on plates and carefully cut into the paper using either scissor or a sharp knife. Yum, this sounds delicious and so simple! I’m definitely going to have to make this the next time we buy cod. Do you think the recipe would work with another type of fish, such as tuna steak or tilapia? Hi, and thank you for liking and commenting on my post! For this type of recipe I would not use tuna, but tilapia would be fine. Tuna is better pan seared so it cooks to a medium rare. Thanks for the tip! I’ll definitely be trying this out during the upcoming week. Great! Let me know how it turns out. Enjoy!